Maplewood business Pie Oh My was hit by vandals, they posted on Twitter on Monday. They say they’ll be closed Tuesday for cleaning up and back in business on Wednesday. The suspect, 22-year-old Michael Brooker, broke into Pie Oh My, took off his clothes down to his boxer shorts, and then spread either blackberry or blueberry jam all over the inside of the shop, KMOV reported. Maplewood Police said a person in the area called the police about a man in his boxer shorts, covered in blood, standing outside near the art gallery. After police contacted Brooker, investigation showed him to be responsible for the damage to the two businesses. According to Maplewood Police Brooker was charged with burglary and property damage (both 2nd degree). Due to unforeseen circumstances (some random rowdy vandalism) we will be closed tomorrow (Tuesday). We are spending the day cleaning — see you on Wednesday! Across the street Brooker apparently tried to break into Architectural Design Guild, breaking a window, and made an ‘X’ with the jam on another window. The “berry bandit” strikes again! Back in the old days we called this a Big Mac attack. He probably found out how much they charge for a pie and lost his mind. We should all do our part and support Pie Oh My in the best way possible; buy from them after they reopen. Sigh … why would anyone do that to a happy place like Pie-Oh-My? Any destruction of other people’s property is terrible, but a bakery? Really?? Shame on those vandals! This is very disappointing as well as expensive for businesses. 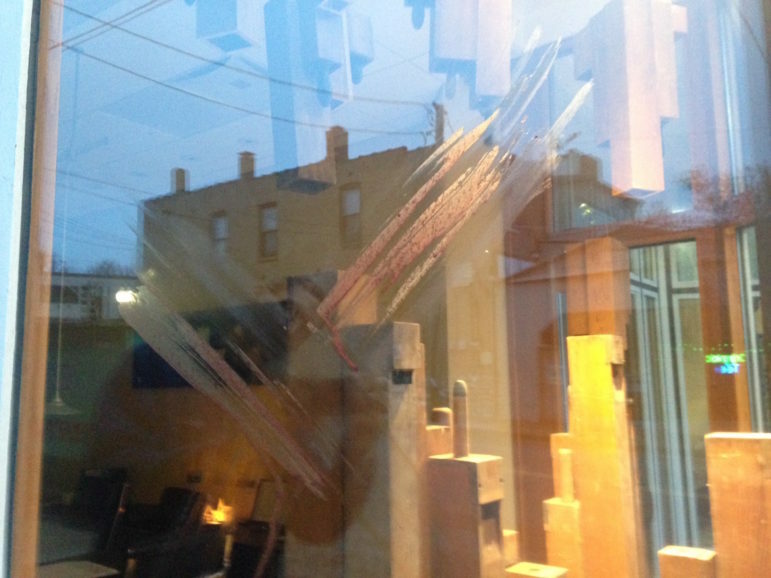 It looks like Architectural Guild across the street was hit as well–broken window glass and painted “x”.